We got the Indian vegetarian cookbook, Prashad, some time ago but haven’t used it much, something that needs to be remedied as the recipes are delicious. The balance of spices has a real depth but be careful with the asafetida as it can easily overwhelm the dish. We served this with a home-made dhal and naan breads from the Indian takeaway. Crush the chillies and ginger together with a pinch of salt in a pestle and mortar (or a blender) to make a fine masala paste. Heat the oil in a large heavy-based frying pan over a medium heat, then add the cumin and mustard seeds. When the seeds start to pop, turn the heat to low and stir in the asafetida. 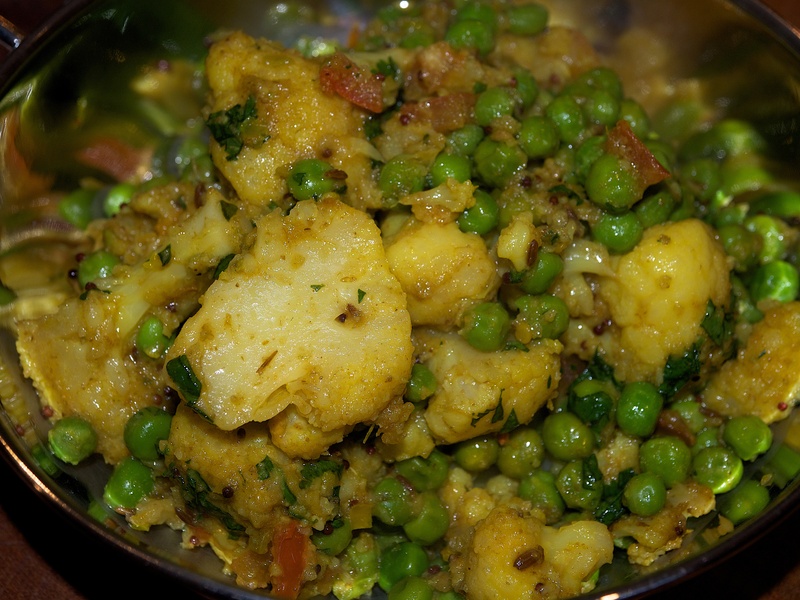 Add the cauliflower, then turn the heat back to medium and stir in the masala paste, turmeric, ground coriander, salt and sugar. Cover and leave to cook for 8-10 minutes, stirring every few minutes. Stir in the peas and tomato, cover the pan again and cook for another 3-5 minutes. Remove from the heat and sprinkle with the chopped coriander, then leave to rest, covered, for 5 minutes before serving.